São Paulo offers everything you’d wish for and more from a big city. Since it’s a sprawling metropolis and the best options are not always close together, the best tactic for making the most of your day is to look for regions that have a few interesting places. Saturdays are ideal for sightseeing around this dynamic city. It offers you a mood that is far more calm and relaxed. To follow the suggested itinerary schedule, click on the links throughout the article, or use your mTrip Sao Paulo travel guide to find the places. Whether you’re traveling alone or with friends, you will have a great day of sightseeing if you follow my short day trip route, which includes a flea market, feijoada for lunch (a traditional Brazilian stew), a samba presentation, and a sample of great caipirinhas (Brazil’s national drink). With this route, you’ll finish the day with freezing cold beer (the only way Brazilians drink it) in an authentic boteco (a traditional Brazilian bar). Whether you like samba and beer or can’t stand them, you are guaranteed an itinerary that will allow you to slip into the unique Sao Paulo mood. These activities will show you a little of what is very characteristic of the local culture as well as the culture of the country. And best of all, it includes caipirinhas! The route begins with a traditional street fair held at Praça Benedito Calixto (the word praça means plaza, or square), which is located in the famous Pinheiros district. The city of Sao Paulo is divided into districts or neighborhoods, called bairros. There you will find numerous stalls selling a little bit of everything. On weekends there are often up to 300 stalls set up. 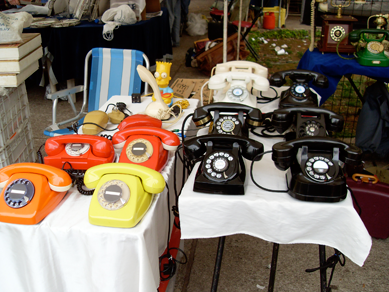 At the flea-market style booths, you’ll find things like old wall clocks, sunglasses from past decades and second-hand antiques. At other booths you can find many handmade pieces, especially home décor products, such as tablecloths and tea towels. The highlight of this market is the food stalls. You can find food from different regions of Brazil, including more spicy and fish-based food from the northeastern beaches of Bahia, hearty, meat-based home cooking from the small country towns of Minas Gerais, and delicious Middle Eastern dishes and snacks, made popular in Brazil by the country’s large Arabic immigrant population. Yummy pastries and sweets are also an option. If you can resist though, the trick is to not have lunch there – only have a snack if you get hungry while visiting the place. Try to arrive at the Plaza around 11am. This fair is between Cardeal Arco Verde Street and Teodoro Sampaio Street, which are most famous for their many music stores. They are ideal for anyone looking for Brazilian percussion instruments. The combination of a flea market with musical instruments stores definitely draws a certain type of local to this charming feirinha area (feirinha means little street fair). You’ll get to talk to (or at least people watch) the trendy and beautiful people who spend their days in this bairro. After walking around the Praça Benedito Calixto’s shops and stalls and picking up a few unusual products, there’s nothing better to fill your hungry belly than by having lunch at a traditional samba bar that’s located a few minutes walking distance from the square. This famous Bar and Restaurant called Ó do Borogodó, was founded in the ‘90s to offer the best of samba and choro (two of the most famous styles of Brazilian music). On Saturday doors open at 1:00pm and the main dish is their legendary feijoada, which is actually served as the daily special every Wednesday and Saturday in many Brazilian restaurants. Ó do Borogodó serves undoubtedly one of the best feijoadas I have ever tasted in my life—apart from my mom’s, of course. The trick is to arrive at the restaurant around 2pm to best enjoy the meat and the music. At Ó do Borogodó, you can order feijoada and sip a refreshing caipirinha. If you’re not a fan of all the sugar served in a caipirinha, order it with sweetener, or adoçante. The samba begins at 3pm and continues into the afternoon. 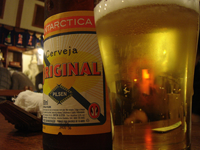 During the presentation, many people drink bottled beer (600ml) and dance samba at the restaurant. You can do the same! Don’t be shy! The ambiance is so happy and lively that staying here without dancing is just not possible. An afternoon here will truly make you feel like you’re in Brazil. Check out the samba video. After allowing yourself to be infected by the irresistible atmosphere, make your way back to Praça Benedito Calixto. On your way back, stop nearby at Bar do Biu to do something very traditional in the Brazilian culture: have a beer at a boteco. Botecos are rustic bars that serve cold beer and petiscos (appetizers) in a very simple way. There’s always more than enough fun to go around, though you’ll sometimes find a lack of seating for everyone. However, no one minds enjoying a beer while standing outside the bar. When you order beer in a group at a Brazilian bar, you’ll have to choose your poison as a group. In this case, I would suggest Brahma and Skol because they are light national favorites. The beer will be served in a large communal bottle with small glass cups for everyone to share. You can be picky and insist on your own drink but if you want a more traditional and convenient experience split that big beer with your friends! If you finish the bottle and want another one, you can communicate that by taking the empty bottle out of its bucket or cozy and leaving it out. I hope you enjoy this Sao Paulo itinerary for your Saturday sightseeing. You’ll be surrounded by beautiful and unpretentious people. If you have a chance to try out the itinerary, come back here to leave a comment about how it went for you. Enjoy! Written by Diego Ramos from insidesaopaulo and edited by Danielle from Danielle in Brazil.